Larger than life, wild, scary and androgynous – Grace Jones plays all these parts. Yet here we also discover her as a lover, daughter, mother, sister and even grandmother, as she submits herself to our gaze and allows us to understand what constitutes her mask. The stage is where her most extreme embodiments are realised and her theatrical imagination lets loose: this is where the musical of her life is played out. The film includes Grace’s unique performances singing iconic hits such as Slave To The Rhythm, Pull Up To The Bumper, as well as the more recent autobiographical tracks Williams’ Bloods and Hurricane. These personal songs also link to Grace’s family life, as the film takes us on a holiday road trip across Jamaica, where her family roots and the story of her traumatic childhood are uncovered. In Jamaican patois, ‘Bloodlight’ is the red light that illuminates when an artist is recording and ‘Bami’ means bread, the substance of daily life. 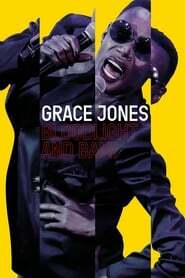 Grace Jones: Bloodlight and Bami weaves together the layers of Grace Jones’ public and private life, as she moves effortlessly between different facets: she is gypsy, artist and partying hedonist, warm and funny but also a fierce and tenacious businesswoman. The performance continues to move thematically though the film, with Love Is The Drug acting like an aria, bringing the film to its final and most touching scenes. This is a Grace we have not seen before, someone who reminds us of what it is to dare to be truly alive.